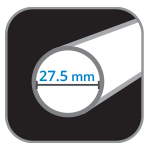 We wanted to develop the lightest shafts with the most accurate bend curves. Pre-impregnated fabric has the lowest resin uptake and provides the most consistent production. HYBRID CARBON is strong and economical; a great combination when paired with Starboard’s Enduro Tiki Tech blades. – A balance in performance between stiffness and flex. – Perfect grip for long distance. *Blade and handle sold separately.